Sometimes an artist’s career can be measured in the dominance he or she had in one year: Michael Jackson in 1983, Madonna in 1985 or Nirvana and Pearl Jam in 1992. But they can never measure up the phenomenal year that Elvis Presley had in 1956, which this new boxed set focuses on. Presley was on the rise in his tenure with Sun Records, but when he signed with RCA, his career and popularity skyrocketed. The amazing music he recorded in 1956 (consisting of the self-titled debut and the Elvis album) speaks for itself: “Hound Dog,” “Don’t Be Cruel,” “Blue Suede Shoes,” “Heartbreak Hotel,” “Love Me Tender,” “Lawdy Miss Clawdy,” “Ready Teddy,” and others—Presley already cemented his legacy just on those songs alone. Adding to the collection to further reflect that extraordinary year he had are concert performances, outtakes of “Heartbreak Hotel,” “Lawdy Miss Clawdy” and “Shake Rattle and Roll”; and interviews with Elvis and Col. Tom Parker. 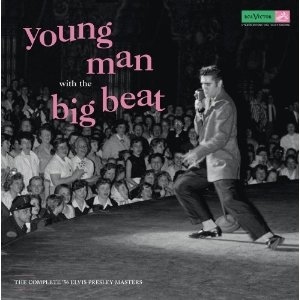 The highlight is probably the thick booklet containing a day-by-day diary from 1956 of Presley’s activities including concert dates, recording sessions, filming Love Me Tender, and TV appearances on the Steve Allen and Ed Sullivan shows.